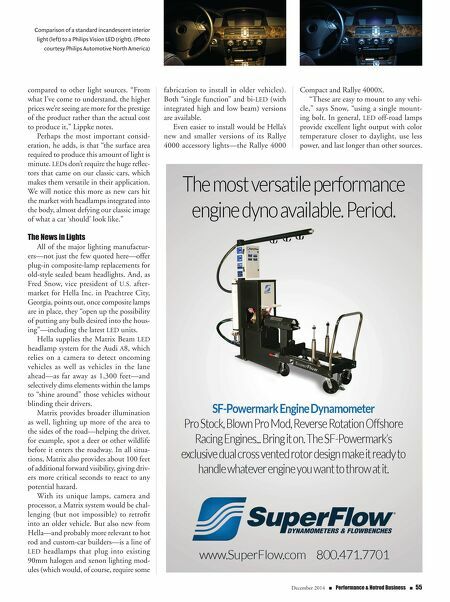 54 n Performance & Hotrod Business n December 2014 HOTROD L EDs—Light Emitting Diodes—are revo- lutionizing automotive lighting at the OEM level, and rapidly advancing into the hot rod and restoration aftermarket. And we don't use the word revolutionizing lightly. In early October, shortly after we began research for this article, the Nobel Committee for Physics announced that the 2014 Prize for Physics would be shared by Shuji Nakamura, Hiroshi Amano, and Isamu Akasaki—co-inventors of the blue LED. Red and green LEDs had been avail- able for decades. Blue completed the spec- trum, making white LED light possible. And white LED lighting is that significant. To understand the importance of this achievement—and its potential impact on automotive lighting, some perspec- tive is necessary. The familiar sealed beam headlamps, which were standard equip- ment on every car sold in the U.S. from 1940 through 1984, were simply incan- descent bulbs manufactured to a particu- lar specification. And incandescent bulbs haven't changed in principle since Thomas Edison's bright idea of 1879: An electric current heats a filament, causing it to glow; while a glass bulb filled with relatively inert gas (e.g. nitrogen) keeps the hot filament from oxidizing. Composite halogen headlamps, which first appeared on some European cars in the late 1950s, are just better incandescent lights, with more sophisticated (and more expensive) permanent lenses and reflectors, and replaceable bulbs in which a gas from the halogen column of the periodic table (usually iodine) allows the filament to glow brighter. Adding utterly inert xenon gas to a halogen light produces an even brighter, whiter light. HID (for High Intensity Discharge) headlamps eliminate the fila- ment; instead, vaporized metal inside a pressurized xenon atmosphere emits light when it is ionized by an electric arc. LED lights, on the other hand, are entirely solid-state. As an electric current displaces electrical charges inside a semi- conductor, as some electrons drop back to lower orbits within their atoms they release energy as light. This is why the first LEDs worked best at the lower-energy red end of the visual spectrum. Dropping an elec- tron far enough to release high-energy blue light was much harder, but the develop- ment of gallium-nitride semiconductors made it possible. Freed from the need for a glass bulb, LEDs can be made much smaller than any other light source. They are also enor- mously more energy-efficient, producing as much as 300 lumens per watt, compared to just 16 lumens per watt for incandescent bulbs. The implications should be obvious, not only for global energy consumption but also for drastically reduced current draw on an automotive electrical system. Bogdan Durian, of Delta Tech Industries in Ontario, California, kindly provides us with some specific numbers. A sealed beam low beam requires 35 watts or about 3 amps on a 12-volt system. Halogen bulbs are brighter but require 55 watts on low beam, or 4.6 amps. More efficient HIDs can produce four times the light of halogen lamps for the same 35-watt consumption as a sealed beam. But an LED low beam requires only 25 watts, or 2 amps, to produce as much or slightly more light than an HID, at a color temperature more friendly to human eyes. "They are so efficient in converting electricity to lumens," observes Sheldon Lippke, lead electrician at Bennett Coachworks LLC in Milwaukee, "that it requires little more than a signal wire to provide enough juice to power them." "At the 2,000-lumen level," adds Durian, "you are very comfortable, you have the road illuminated evenly. And you are not blinding anyone." Another advantage to LEDs is that they light up nearly the very instant that current is turned on; nothing has to warm up, as in the other light sources we've mentioned. HIDs actually represented a step backward in this respect, requiring as long as 20 sec- onds to reach full output. "That's why, in the beginning," says Durian, "you see a little flicker and delay." But LEDs also illuminate significantly faster than incandescent bulbs. The dif- ference is most significant when applied to brake lights, where, according to Ann- Marie Hines, senior marketing manager for Philips Automotive North America in Farmington Hills, Michigan, "braking distances from 75 mph can be reduced by up to 20 feet." Moreover, LEDs can theoretically last up to 100,000 hours, or about 100 times as long as an incandescent bulb. According to Lippke, the life of an LED lamp is lim- ited mostly by the quality of the circuit board behind it. Even manufacturing cost is reduced Red LEDs complement the red and black interior of a '69 Cougar, restored by Mo' Muscle Cars. 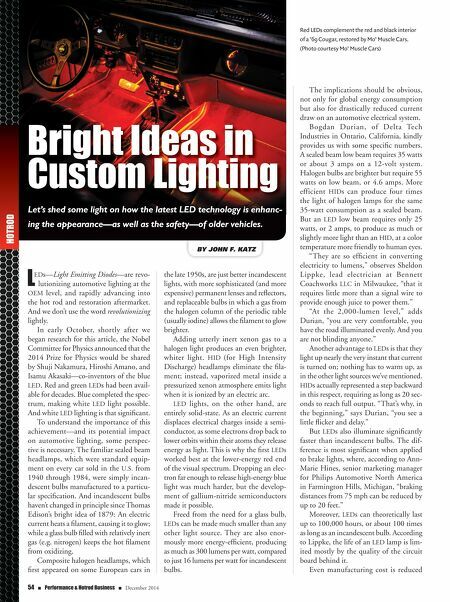 (Photo courtesy Mo' Muscle Cars) By John F. Katz Bright Ideas in Custom Lighting Let's shed some light on how the latest LED technology is enhanc- ing the appearance—as well as the safety—of older vehicles.